SEE www.Ottawa-Rental.de for more info, maps and pictures!! 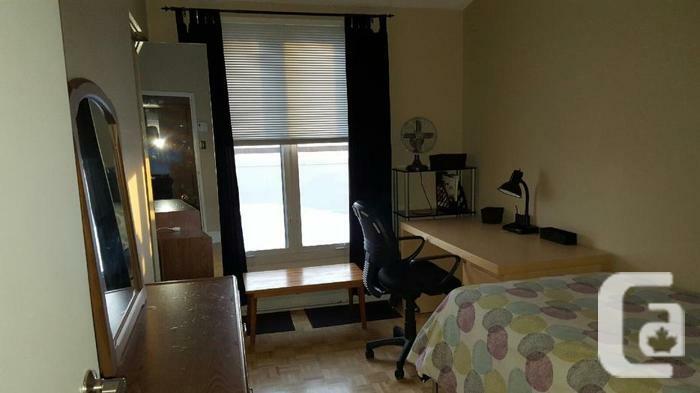 Fully Furnished Room for a Mature, Quiet, Clean, Non Smoker - Available May 1st, 2019. ONLY $619 / Month All Inclusive !!! AC/Heat, Electricity, In Room Cable TV Service, WIFI, Networked Printer & Furniture (Single Bed, Big Desk, Lamps, Shelving, etc.) ALL INCLUDED! Renovated 3 Bed / 2 Bath Penthouse Suite with Hardwood Floors throughout the Apartment. Large Common Living Area. Very Large Corner Balcony with Panoramic View of the City. OCTranspo Bus Route Stops at the Corner of the Property. Riverain Park, Adàwe Crossing (Footbridge), Strathcona Park and the Capital's Multi-Use Pathway Network near the Condominium Complex. No Pets Please. Perfect for Mature/Serious UOttawa, College, or International Exchange Students, as well as Young Working Professionals, or Athletes. A Must See - Book a Visit Today!